Epson has taken the wraps off its second generation smart glasses at CES in Las Vegas. It showed off the Moverio BT200 smart glasses at the event and revealed a number of new features. They include Android 4.0 support, Bluetooth, head-motion tracking and Dolby Digital Plus. There is also a front-facing camera, as with Google's Glass smart glasses. 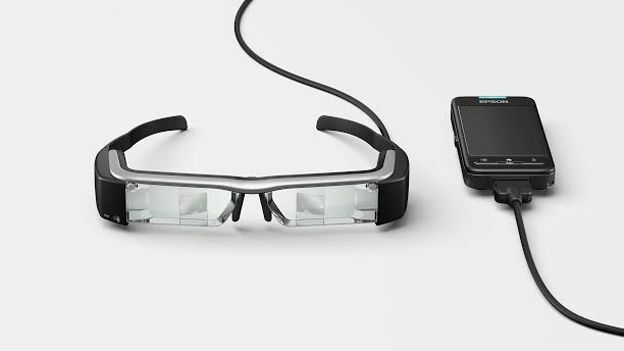 However, Epson is keen to avoid some of the problems faced with Google Glass. It has stressed that the camera is normally off, and when it is operational, a red recording light is clearly visible on the device. Another major difference with the glasses is that within the lenses themselves, there are two mini transparent displays. “These glasses are essentially two small LCD projectors,” said Anna Jen, director of new ventures at Epson. However, despite the obvious comparisons, the company isn't targeting the smart glasses at consumers – at least not in the same way that Google is. According to APX – one of the software developers working with Epson – the glasses are designed for productivity instead of fashion. They will see for €699 a pop – the same as the first generation of Epson's smart glasses, the BT–100. According to the company, they should be out in the Europe in May.